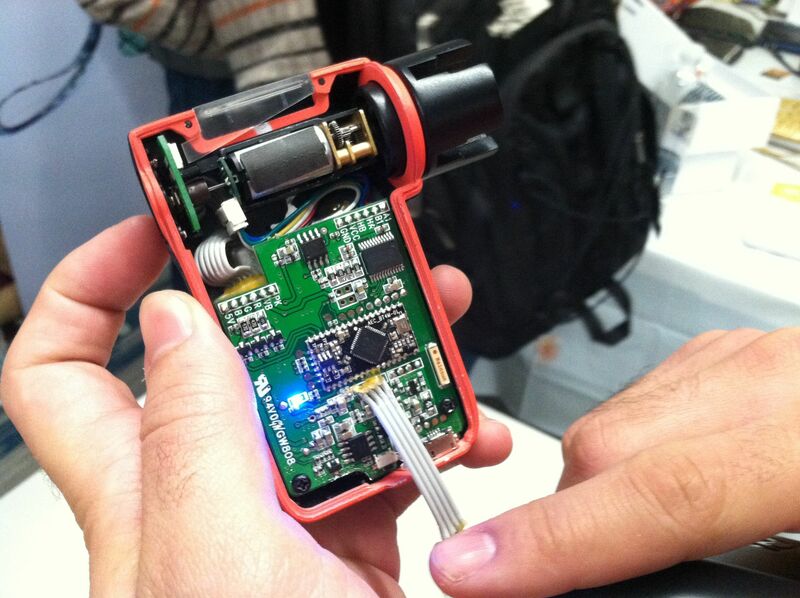 The 2013 class of HAXLR8R startups showed their stuff to a crowd of reporters, investors, and fellow hardware hackers at San Francisco’s Runway yesterday. The demo day event drew more than 100 people and was part coming out party and part fundraising pitch. The startups had all just returned from 111 days in China and many launched crowdfunding campaigns to coincide with the event. Everpurse COO Melissa Pierce shows off her Everpurse. If there was an unofficial theme to many of the newly minted hardware companies it was wearable technology. Four of the 10 startups had developed some form of wearable tech. Everpurse was a crowd favorite. The device charges smartphones on the go from a dock hidden in a purse. To charge the dock you simply lay it on top of a charging platform. There’s even a GPS function to track lost or stolen purses. “Technology isn’t integrated into the way we wear our lives,” said CEO and founder Liz Salcedo. Instead of simply adding a blinking LED onto a lapel or jewelry, she said he aimed to create a highly functional device made for the mobile lifestyle. According to Salcedo, Everpurse already boasts $500,000 in funding and deals with high-end purse makers. No word if they’re going to add a man purse so that guys can get in on it, too. The creators of Wearpoint Tact hope to make the use of Google Glass more inconspicuous. In what is sure to be one of many Google Glass peripherals, Wearpoint has developed Tact, a BLE device that’s designed to be more unobtrusive than tapping your temple or speaking commands to operate Google’s wearable computer. Matchbook-size Tact allows the user to control his or her Glass with finger taps on a device mounted to shirt cuff, belt, car keys, or wherever. The makers of New York-based Notch have produced a triangular shaped device that captures movement data (think golf swings and tennis serves) that can then be analyzed. It’s meant to be snapped onto clothing or slipped into specially made pockets. Co-founder Stepan Boltalin calls it the first “truly wearable technology API for clothing.” They plan to sell the devices as well as shirts with Notch-size pockets sewn into them. 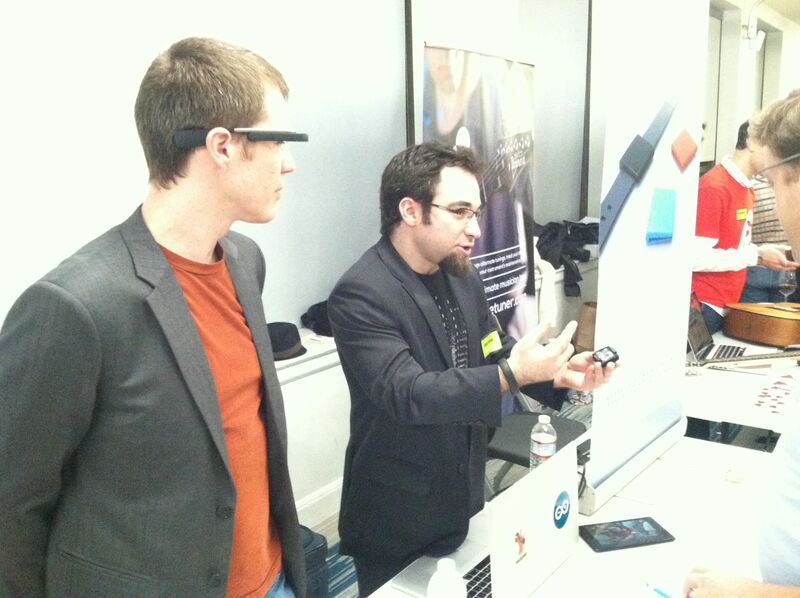 But there were more than wearables debuting their wares. To the growing field of petbots comes Petcube. The company is already Kickstarter’s top earner in the pet space. The device seeks to combat pet boredom in left-at-home pets (and the guilt in pet owners) with a gadget that lets you watch you pet, speak to them as well a dazzle them with a remotely operated laser pointer from a smartphone controlled, cube-like box. Assuming you had the free time or desire, you can even watch and play with other people’s pets. 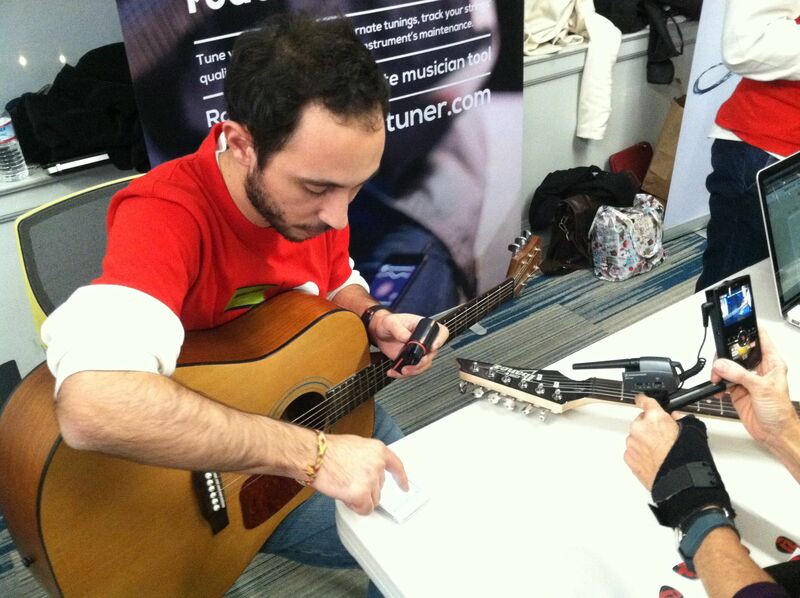 Bassam Jalgha tunes his guitar with Roadie Tuner. One of my favorites was Roadie Tuner, a guitar tuning device that was first hatched in the co-creators’ Beirut hackerspace. The product sits over a guitar’s tuning peg and when an out-of-tune string is plucked it turns the peg to tune it. It also evaluates the elasticity of a string and warns you if it’s getting close to snapping. A peak inside Roadie Tuner. Co-founder Bassam Jalgha said while the project began in Beirut it would have been prohibitively expensive to scale up there given the lack of parts. Traveling to China changed that. While many of the products had an element of fun and lightness to them, Babybe was more serious. Its technology helps prematurely born babies isolated in incubators with a haptic device that replicates the conditions of resting on a mother’s chest, right down to the heartbeat. While all the startups were on the hunt for funding to go into production and improve their designs, HAXLR8R mentor Mitch Altman believed the new class of entrepreneurs was inspired by something more than money.